Published in the South Kent Gazette, 28 November, 1979. A PERAMBULATION OF THE TOWN, PORT AND FORTRESS. Edwards Road, formerly the private road to the old Finnis timber yard, which was later taken over by Tolputts, contained not only the offices of the firm but, on the other side, at the rear of Salem Chapel, stood the Sunday School and Assembly Hall connected with the church. It was built in 1909. The street was named Edwards Road in memory of the late Rev E. G. Edwards, who was minister from 1878 to 1905. Biggin Street, in the early 1900s with fine buildings on either side, and a double line of trams through it, constituted one of the best thoroughfares in provincial Kent. It was through much agitation that the widening was accomplished. The alternative plan was to cut a new street from St Mary’s Church diagonally to Priory Place, and to meet the objection that that would not relieve the congested traffic of the main thoroughfare, it was suggested by way of compromise that Biggin Street also should be partially widened. To those who looked at the subject dispassionately, it was obvious that no other plan could be a satisfactory substitute for a thorough widening of Biggin Street, and when the improvement was completed everyone could see that a narrow main artery of traffic would have been a perpetual nuisance. Biggin Street widened, with a widened Worthington Street (once called Worthington’s Lane) connecting the western Military Road with the direct approach to the Castle, seemed a perfect scheme of street improvement, as far as it went, giving nothing superfluous, yet meeting the necessities of the time. The new frontages which were erected in Biggin Street, along the line where the widening ploughshare ran, were sufficiently varied to avoid dull uniformity. In no case was any great effort made to produce architectural effect, while on the other hand there was no stint in the works necessary to produce substantiality, nor in the ornamentation suitable to buildings devoted to commerce. Statistics have been given of the traffic of Biggin Street in 1893, before the widening. Since then, of course, the traffic has multiplied by leaps and bounds. Not long after the widening in fact it had increased so much that people were wondering whether this main artery of the town had been widened enough. Ladywell begins on the western bank of the river, where, in olden times, were the domestic offices of the Maison Dieu, and the mill which ground the corn for that establishment. Since 1834, when the Government disposed of the Maison Dieu, this spot had been known as Maison Dieu yard, occupied at one time by Messrs. Pinnis, builders; later by Mr George Pry, and last by the late Mr W. J. Adcock. On the 12th of January, 1878, a great part of Mr Adcock’s works here were destroyed by fire. In 1889 the Town Council purchased the Maison Dieu yard for £3,000, to improve the surroundings of the Municipal Buildings, and on a part thereof has since been built the School of Art. The remaining portion of the south side of Ladywell is flanked by the Connaught Hall. In 1903 the side on the north-west, from the bridge to High Street, was pulled down, and the road widened from a narrow lane to its present width. It was not until 1933 that re-building was completed on the space occupied by the old buildings then pulled down to set the north side back so as to widen the road. The “Sir John Falstaff“ was rebuilt in 1903; the premises at the corner in 1907; the Dover Fire Brigade Station in 1931-32, at a cost of £10,000; and in 1933-34 Municipal Electricity Offices and Showrooms were built near the bridge, at a cost of over £6,000. Old Ladywell had many interesting associations, not the least being “the well or our Lady,“ which gave the place its name. That well no longer exists although a remnant of it was unearthed in the mid-1970’s. It was, no doubt, close to the Lady Chapel, which stood near where the Sessions Court now is, and the water of it being of a chalybeate character, probably had some curative properties, which in the days of superstition, were exaggerated as miraculous. Early in the 19th century this well was in a nook of the Maison Dieu wall, with two or three steps for people to go down to dip their water vessels. Before the days of the Dover Waterworks, when good water was scarce, this water was carried all over the town and was held in great repute. Miss Horsley, in her "Memories of Old Dover“ mentions “Teakettle Tom“ as a Dover hawker from whom the old people regularly bought a pennyworth of Ladywell water to brew the afternoon beverage. When the Corporation purchased the Maison Dieu, and used the northern portion of it for prison purposes, the well was covered over and a public pump erected over it. In 1858 this pump was repaired by the Corporation, and a ladle attached to it for the benefit of wayfarers, making it one of Dover’s first drinking fountains. With the prison on the one side and closely-packed human habitations on the other, it was for some time suspected that this spring which runs very near the surface from a westerly direction, could not fail to be contaminated; and in 1866 Mr Alexander Bottle was commissioned to make an analysis, when the verdict of science was that the long-celebrated Ladywell water was not fit for human consumption, whereupon the pump was removed and the well finally closed. Ladywell, in the days of the old Paving Commissioners, was the boundary between town and country. In the year 1839 the road was repaired, at the joint expense of the Paving Commissioners and the Charlton Highway Board. It was then a lane 14 feet wide, paved with cobblestones, the drainage gully running down the middle of it. The Corporation at various times talked of improving this lane, and, eventually, when the prison was rebuilt in 1867, the gaol wall was set back 6ft., at a cost of £250, and the street widened to 20 feet, in which condition it continued until the widening of 1903, the present wide thoroughfare originally with wood paving being a beneficial change from the cramped lane and cobblestones of 1867. New Street and York Street are both very ancient thoroughfares. The first authenticated mention of these thoroughfares is in a Dover charter dated 20th July, 1540, at which time the part which is now called New Street was described as Turne-againe Lane; and York Street was then called Priory Lane. and in battle, side by side. Whom now we welcome here. 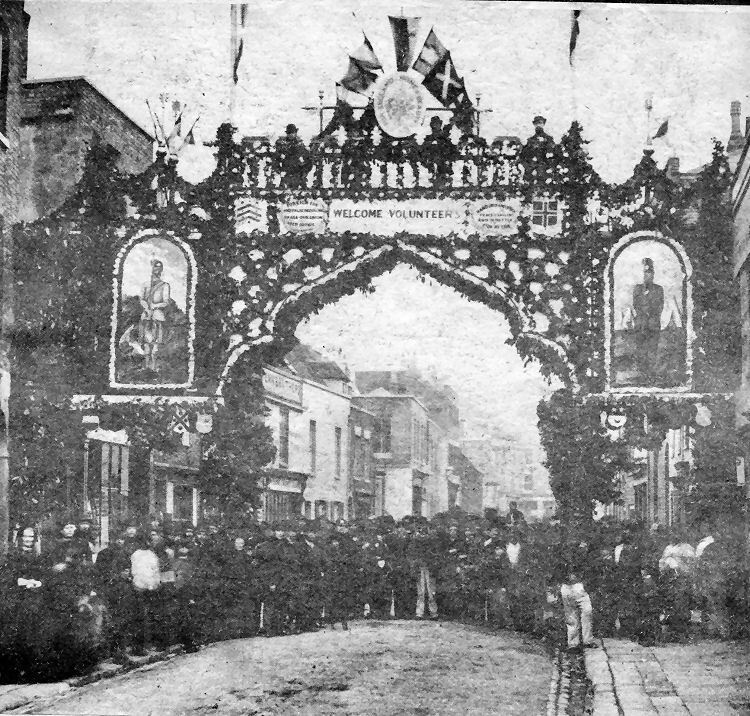 These were the sentiments of proud and grateful Dover people who erected this elaborate archway of welcome in Biggin Street, near Maison Dieu House — now the the library — to the honour of men of the East Kent Volunteers on their return from battle a century ago. The Volunteers served in Kent’s own Regiment, long known as the Buffs, whose modern counterpart is The Queen’s Regiment. This photograph, (above) which may date back as early as 1869, is one of a pair which are contact prints of 12 inch by 10 inch glass negatives. The second photograph will be published later. The welcome message, above, is included in the design of the archway. Construction of such archways seems to have been a tradition in Dover and may have had its origin in the old walled town with its series of gateways. A number of old photographs exist showing archways in various parts of the town. On the right of the picture is believed to be the "British Queen" public house. Just beyond it, through the arch can be seen a sign bearing the name R. Rose. Richard Rose was a corn dealer. Through the arch on the opposite side of the street is the prominent sign of Penn Brothers. An 1875 street directory indicates that Charles Penn, at 11 Biggin Street, was a cabinet maker, upholsterer and undertaker. Penn brothers, according to another sign over the lower windows, also had premises in the Market Square. Nearer the camera is the shop of S. Coveney, a market gardener, seedsman and fruiterer, who was at 9 Biggin Street. The shop with a large expanse of glass for those days, which stands next door, was that of J. Cowley Blackman, a tea dealer and grocer. In the centre of the patient crowd posing for the photographer, who was handicapped by having to make long exposures, is a sergeant in the uniform of the Volunteers. 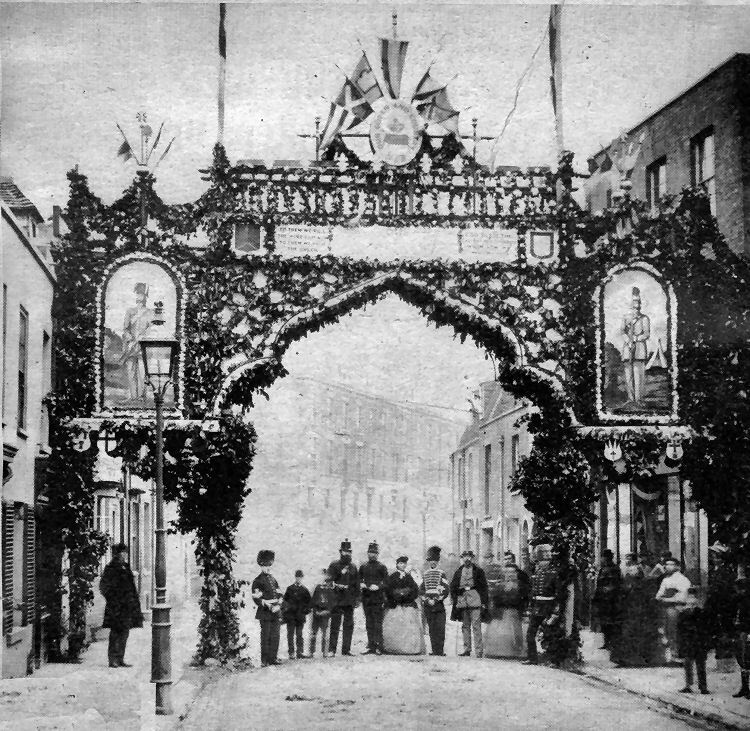 Dating from about 1869 this Biggin Street photograph depicts the other side of the ceremonial archway. Apart from the variety of uniforms worn by the soldiers the most interesting feature is the lofty St Martin's Terrace, as it then was, facing the Town Hall.